Unless you are 100% satisfied with your website’s lead generation and performance, at some point you will likely find yourself having to choose a new website solution for your martial arts school. I created this article to give you some insight on what your options should be, and to give you a checklist so you may make the right decision when you choosing your martial arts website company. Do you specialize in Martial Arts Websites, and what are my customization options? This should really narrow down your choices, as you will likely come up with 2 or maybe 3 companies that you are comfortable doing business with, whose website examples reflect your brand and image. If the answers to any of the above questions are “no”, you are dealing with someone that is not willing to put in the work necessary to make your website unique and personalized for your school. A﻿t Website Dojo we pride ourselves with giving our clients the most unique sites possible. Even if the client is too busy or can’t be bothered with the design process , we always strive to customize a site as much as possible, and it does indeed take us a few weeks to get a site launched (due to the fact that we actually have to work on them to make them pretty, unlike some other companies, cough cough). A responsive website resizes / rearranges itself depending on the device it is being viewed on to optimize the browsing experience. You can test this by simply resizing a browser window, if the layout disappears off the page, the website is not mobile ready and will be affected by Google Mobile Rankings. Make sure the responsive version of the site retains all elements and that things don’t look out of place, since a badly designed responsive website also kind of defeats the purpose. Alternatively, a website provider might offer a separate mobile website, but this is usually a simplified version that does not reflect the desktop version graphics, and looks pretty lazy to the visitor. Website Dojo sites are completely responsive and perfectly coded in CSS. When a site is launched it is submitted to Google Webmaster Tools to make sure they are 100% mobile friendly. Can you please explain to me your marketing funnel? A marketing funnel is the process your website leads go through after a user has engaged with your site. Lead Capture (Form) & Auto Responder. Lead capture (Form), E-mail Auto Responder, Automated Email Sequences driving traffic back to the offer and explaining your services, as well as Facebook Ads Pixel Retargeting or Google Ad Words Remarketing. This means that when visitors leave your website, your ads follow them around on Facebook as well as on websites displaying Google Ads. Some platforms will have the ability to generate stand alone landing pages that will allow you to make special sales offers you can promote on social media (like a holiday specific Flash Sale or a tournament registration), and these pages will also have the ability to have follow up sequences and Facebook & Google Ad Words integration, taking your site even further down the funnel. Website Dojo does all the above; by default each page has a lead capturing form (or more!) which is linked to an e-mail auto-responder (The system can also send Leads via SMS Text Message as well). Email sequences can be turned on after the client has reviewed our default email content and has made edits to make it more personal to their school. The e-mails talk about what to expect when you come to class and from martial arts, also encouraging the prospect to contact the school if they have not scheduled their first class. Buddy passes are offered along the way, as well as incentives to drive traffic back to the website if the School Owner has any other offers like a trial upgrade available. Facebook Pixel Code (for ad retargeting) as well as Google Ad Words Remarketing Code can be easily dropped in by request, or is handled automatically if enrolled in the Dojo Digital Marketing program. Our DojoCart (+$49/mo) allows you to create stand-alone pages you can easily setup and edit and collect payment directly on. These can be setup for Pro Shop Products, Tournament Registrations, or Social Media Flash Sales. Can I edit the content of the website on my own? Most modern websites will offer a Content Management System that allows the site owner to access a back end and make edits to his website content. At the very least, you should have the ability to edit your trial offers for your programs. If you do not have the ability to do so, you are left to rely on your website company to handle the changes for you. The Website Dojo Content Management System is the most advanced in the industry. Programmed from the ground up with a proprietary back end software, our CMS not only allows you to edit the content of your website, but also offers Website Statistics such as Website Traffic & Search Engine Rankings, as well as online marketing Video tutorials. The system is constantly getting upgraded and improved, and will continue to do so to always be the most complete in the industry. Our CMS is NOT a WordPress or an out of the box solution, it is custom built to be the most user friendly platform dedicated to martial arts websites. Since we have designed and built the software, we have full capabilities on continuining to program it and improve it with new features and additions! How many leads can you guarantee? Can I collect Paid / Free Trials? This will usually be a telling question depending on the answer you receive. The real answer should be “no company can guarantee you any amount of leads”. There are many factors that will determine how many leads you will get, such as how populated of an area do you live in, what kind of search traffic there is for martial arts schools, and most importantly what kind of additional marketing are you supplementing your website with. A school owner running print marketing campaigns, referrals, Google Ad Words and Facebook Ads will inevitably get more leads than someone not marketing their school. The Website Dojo platform is designed to engage visitors and capture leads. If you have hardly any visitors, you can expect to get hardly any leads. So marketing your website is very important. Our better performing single location schools involved in online marketing see upwards of 50-75 leads a month. (We consider a Lead someone that has input full information, not just an email optin). However the same exact website might generate 10 leads a month for someone that is NOT promoting it. Website Dojo captures all the leads in the back end CMS as well as sending them out via email. It also gives you the ability to view your website rankings and traffic statistics so you can see what needs improvement. You are able to collect Paid and/or Free Trials offers. When a lead pays for your trial, the transaction takes place on your website and the funds get automatically deposited into your bank account. Do you require contracts & commitments? Every martial arts school requirements are different. Also the way each website performs is different. We are aware of competitors that not only have an inferior product, but also require 2 years worth of contract. We have dozens of clients wanting to signup but on standby until their contracts run out. Some are so dissatisfied that they jump ship in the middle of their contract and keep two website payments. Ask yourself what confidence does a website provider have in their services if they need to “trap you” against your will into an agreement you are no longer happy with. At Website Dojo we do not require any contracts or commitments, just a 30 day cancellation notice! No entrapment here. If you are not happy, or your business situation changes, you can walk away and we will wish you luck. We believe in our product, and are sure you will love it for years to come by choice. What about my Domain name? Does it stay the same and does it stay in my name? I am including this question with a particular company in mind that has been doing a really dirty trick on their customers; After signing a multiple year contract, they request you transfer the domain name in their name so they can “Manage It”. If at any point there is a disagreement, they repossess the domain and hold it hostage. There is nothing to manage as far as a domain goes, just one setting changes. Do not give up ownership of your domain!!! Your domain is valuable and you always want to avoid starting with a new domain as you will have really poor rankings vs. your established old domain. At Website Dojo we do handle lot of our clients domains, but we never, ever take possession of them. Your new website will have the same domain as it does now, and it will simply have a setting changed that will point it away from your old website, to the Website Dojo Servers. What about SEO? Is it included? This is a classic question that usually gets asked without the client even knowing exactly what they are asking, because it is a fairly complex topic but I will try to explain it simply. On Page SEO: This involves having the website coded properly, and inserting keywords in the pages Titles, descriptions and content. For example if the most searched local search term is “Martial Arts Classes in Your City”, this sequence of words would also be included in the Page Title Code, somewhere on the page as a Headline (H1), and throughout the website. Ongoing SEO to improve rankings (Off Page SEO): Almost 100% of the time this is a separate service from your website fee. If someone tells you “SEO is included!” they are just trying to give you a “YES” answer, by telling you that On Page SEO is included, which is NOT the same. Modern day SEO is done ONLY one way as far as Google and Search Engines are concerned, and that is through Content Marketing. That means someone is creating content on your website blog, and is then promoting it to generate shares and back links to it. The more links pointing back to it a website has, the better the rankings. You can expect to pay $500-1000 a month for this service by anyone that knows what they are doing. So it is just extremely unlikely that it “IS” included. Blackhat SEO: This is something that used to be done with various degrees of success but in last few years Google is actually banning websites that engage in this activity. If someone promises you magic ways to get you to the top of Google, they are likely putting your website at risk of getting a Google Penalty (banned from Google). You must EARN backlinks to increase your rankings, you can never buy them or become part of a network that exists only for the purpose of ranking your website, or you might find yourself completely off Google due to a penalty. With this being said, a properly coded website will find itself ranking pretty well on its own in smaller martial arts markets, in due time. Website Dojo clients report to us constantly that their websites are dominating their local Search Engine Results. We cannot make any guarantees on the results , however we provide you with monitoring software that updates every Monday with your latest rankings. With our online marketing videos we also give you tips on how to improve your rankings. Finally, we do offer Online Marketing Services in the form of promoted Blog Posts via Google Ad Words & Facebook Ads. Check out our Dojo Digital Marketing services for more info. Does my website come with a blog? Your website should definitely have a blog, as it is an essential tool in marketing your website on Social Media. A blog also allows you to add content to your website which will result in improved rankings especially if the content is shared or linked back to from other websites. Website Dojo offers two blogs on your website: One on the front end for marketing and educational purposes, and one in the Student Area for communicating with your students. Does the website have a student area? If you provide your students with handbooks, newsletters, testing & forms videos, having a student area will facilitate this by giving your students password protected access to all your assets whenever you upload new content. Website Dojo offers a new student area that is password protected and allows you to have downloadable content for your students, a private video gallery, a message board / blog, your schedule, a private calendar as well as a printable coupon section to create buddy passes or special coupons. OK! So I hope you found this article informative, and that it has given you the information you need to know to compare the different website providers you might be checking out. 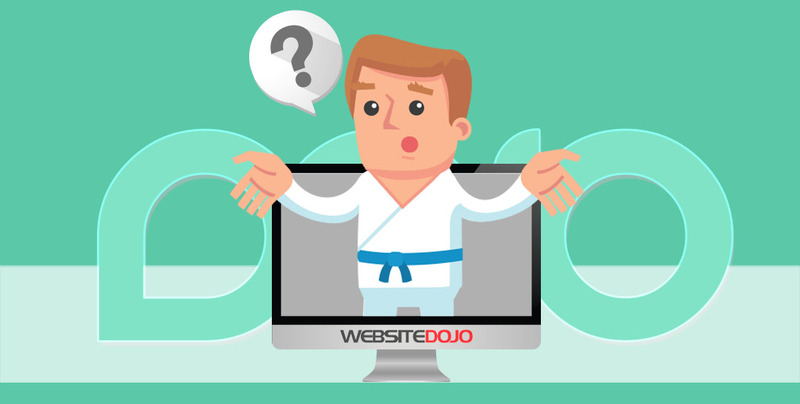 I’m definitely biased, but I believe you will find that no Martial Arts Website Platform on the market offers the features & benefits that you will get by being a Website Dojo subscriber!